It was Christmas, and Lord Warbeck had invited friends and family for the holidays. Lord Warbeck was seriously ill and this would probably be his last Christmas gathering. The guest list included Sir Julius Warbeck who was his nephew and the current Chancellor of the Exchequer. Lord Warbeck's son, Robert, was there. Robert was currently the leader of the League of Liberty and Justice, an anti-semitic and fascist group, and his presence would antagonize Sir Julius. Mrs. Carstairs was there. She was the wife of Sir Julius's immediate second at the Exchequer and her husband hoped to replace Sir Julius as Chancellor, but he was currently on a mission to South America. Lady Camilla Pendergast was there. She hoped very much to become the wife of Robert. Also present was Dr. Bottwink of Heidelberg and the University of Prague who was examining the Warbeck papers for his study of constitutional law. Bottwink, a Jew, disliked Robert Warbeck very strongly, perhaps even more strongly than Sir Julius did. There were also members of the staff such as Briggs, the butler, and his daughter. Rogers, the police sergeant who was assigned to protect Sir Julius, thought that this would be an easy assignment. These were the people in the 53 room manor house on Christmas eve. Outside the snow was piling up, and cutting them off from the rest of the world. The telephone had also stopped working probably from downed lines. They had Christmas Eve dinner at which the conversation was rather strained. Then they left the table, passed a quiet evening, and were in the process of toasting the arrival of Christmas when the murder occurred. Robert Warbeck stated loudly that he had an important announcement to make and dropped dead. Sergeant Rogers assumed control of the investigation, and conducted interrogations and searched rooms in the proper manner. Dr. Bottwink offered some helpful suggestions. The trapped people talked among themselves about keeping silent about some things, and some of them feared that suspicion would fall on them. Eventually Dr. Bottwink announced the identity of the murderer, shortly before the thaw when the police would arrive. 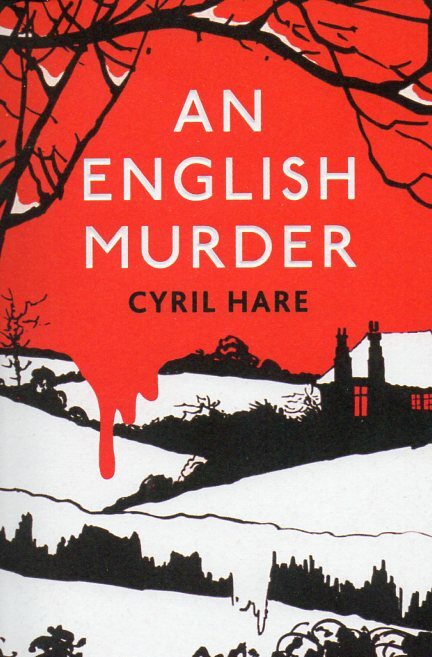 I will tell the reader that the big clue to the identity of the murderer is in the title of the book. This book was written in 1951, and definitely shows the fears and prejudices of the period following World War II. Dr. Bottwink especially was suspected because he was an Eastern European (was he a Communist?) and because he was a Jew. It also shows the decaying position of the upper class such as Lord Warbeck who was suffering financially from the taxation of the current government. I have read this book for the 2018 Just the Facts, Ma'am Golden Challenge. 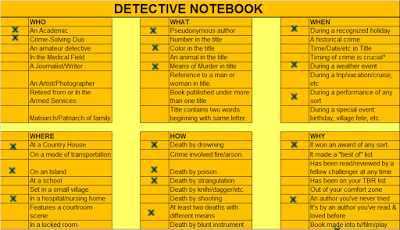 It is entered in my Detective Notebook in the category of When - During a recognized holiday.